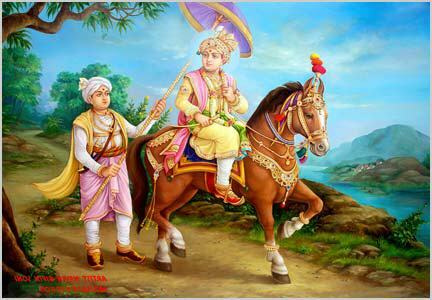 Lord Shree Swaminarayan was born in the Koshal region of India, in a village called Chhapaiya (near Ayodhya, UP). Having served His parents until their departure for Akshardham, the Almighty took to a pilgrimage of India, adopting the life of a nomadic hermit. On completion of the 7 years' sojourn of India, the Lord met up with Ramanand Swami, and established the purest and unadulterated form of religion, based on ultimate devotion to God only, with total observance of non-violent dharma. Shreeji Maharaj re-introduced the non-violent yagnas, on a grand scale. He instructed numerous acts of social welfare; almshouses, fresh water wells / lakes, explained in detail why it is important to worship Satvic deities. Shreeji Maharaj discredited the act of enforced Sati & female infanticide. After the passing of Shree Ramanand Swami, Shreeji Maharaj held a large gathering of the followers at the town of Faneni. It was during this sabha, whilst explaining that God is one, He is Narayan, He is our Swami, Shreeji Maharaj introduced 'the father of all Mantras', Swaminarayan. 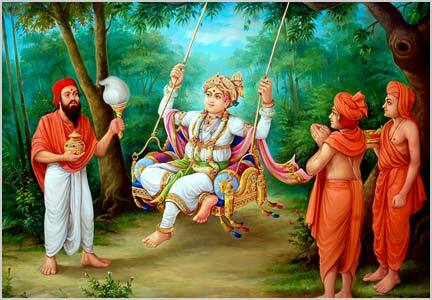 It should be noted that there was no Swami who He had appointed His successor or as an ideal devotee, at that time. The name refers wholly & solely to Bhagwan Purushottam Narayan (Shree Swaminarayan Bhagwan). The poet Dalpatram Kavi dedicates a whole chapter in his granth, 'Shree Harileelamrut Sagar', written on behalf of the Late Acharya Maharajshri Shri Vihaarilalji Maharaj (3rd Acharya on Vadtal Gadi), to the greatness of the name Swaminarayan. He established temples at; Ahmedabad, Bhuj, Muli, Vadtal, Junagadh, Dholera, Dholka, Gadhpur & Jetalpur - installing images of various manifestations of God, such as Nar Narayan Dev, Laxmi Narayan Dev, Radha Krishna, Radha Raman, Revti Baldevji, etc. Shreeji Maharaj made Gadhpur His home, in recognition of the exceptional devoted love from Dada Khachar. At Vadtal, Shreeji Maharaj established the dual Acharyaship, in direct succession to Himself. This He did by means of a legal document (known as Desh Vibhagno Lekh), which He dictated and got written by Shukanand Swami. Learned saints and elder satsangis witnessed this document. Copies were presented to Ayodhyaprasadji Maharaj & Raghuveerji Maharaj - these are currently in the possession of the current Acharyas. Shreeji Maharaj appointed Shree Raghuveerji Maharaj to the Laxmi Narayan Dev Gadi at Vadtal, and Shree Ayodhyaprasadji Maharaj to the Nar Narayan Dev Gadi at Ahmedabad. Presently, H.H. Acharya Maharajshri Rakeshprasadji Maharaj adorns the illustrious seat of Laxmi Narayan Dev Gadi, whilst H.H. Acharya Maharajshri Tejendraprasadji Maharaj has spread the glory of God as Acharya & leader of the Nar Narayan Dev Gadi at Ahmedabad, for the past 4 decades, and passed on the Acharyaship to H.H. Acharya Maharajshi Koshalendraprasadji Maharaj. It is the uniqueness of the authentic bona fide Swaminarayan Sampraday, that the closest a tyagi (saint) comes to leadership is being appointed the Mahant Swami (head-saint) of a Shikharbandh Temple. At all times, the true saints of the Sampraday take their instructions from the Acharya, their ultimate Guru & leader.